Editor’s Note: Want to check out Shanghai Disneyland, but worried about breaking the bank on food, or just want to know more about your dining options? This translated article gives a few options available at the park’s many restaurants and snack stands. What should you eat when you go to Shanghai Disneyland Resort? How much should you expect to spend? A run-down of the best snacks and meals available was recently posted on a public Weibo run by “The Usual Suspects.” The article included a number of photos and the author claimed that there is enough food at Disney to make yourself sick, so come in with an empty stomach. 1) Corn Dogs, 25 RMB: A very filling snack topped with yellow mustard. A corn dog is a hot dog covered in cornmeal, and it comes in large and small sizes at Shanghai Disneyland. 2) Fruit and Chocolate Tarts, 25-45 RMB: The fruit tarts pictured are only 25 RMB and the chocolate Mickey shaped tarts will run you 45 RMB. 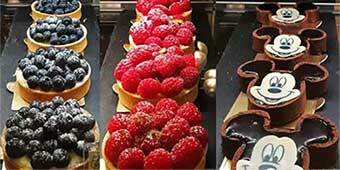 The cakes are sold at Remy’s Patisserie. British tea is also available for 15 RMB. 3) Fruit Cup, 20-35 RMB: These fruit cups are sold in stalls throughout the park. You can also get a cup of grapes for 20 RMB. 4) Giant Turkey Leg, 55 RMB: One of the most popular and iconic Disney park foods- the giant turkey leg. They will run you $9.99 at Disneyland in California. Shanghai’s are a bit cheaper, but also a bit smaller than the ones in California. The turkey legs at Tokyo Disney are about the same size as the ones offered in Shanghai. Like in the California park, the turkey legs are wrapped in a special packaging to lock in moisture. Customers are also given special gloves to eat the legs with. 5) Waffle Cone, 45 RMB: Beat the Shanghai heat with an ice cream cone from Il Paperino, a Donald Duck-themed gelato shop. You can also find packaged ice cream bars and popsicles from vendors for about 25 RMB. 6) Soft Pretzels, 30 RMB: Mickey-shaped pretzels are available for 30 RMB. 1) Hamburger, 75-80 RMB: If you want to eat quickly, head to the Tomorrowland Terrace and grab a hamburger package. The full meal comes with a burger, fries, and a soda and costs 80 RMB and the burger alone is 75 RMB. 2) Pizza, 85 RMB: Grab a Mickey shaped pizza in Fantasyland at Pinocchio Village Kitchen. The pies are topped with Beijing roast duck and cost 85 RMB with a drink. 3) BBQ Ribs or Grilled Squid Risotto, 85-95 RMB: Head to Treasure Cove’s Barbosa’s Bounty, a large barbecue restaurant. Have some barbecue or risotto for 95 and 85 RMB respectively including drinks. Kid’s meals at the restaurant cost 60 RMB. The Royal Banquet Hall offers a choice of appetizer, dinner, and dessert and drinks for 368 RMB. Children aged 10 and under can chose from a children’s’ menu that costs 258 RMB. Meals at the Royal Banquet Hall are subject to a 15% service charge and require advance reservation. There are four appetizer choices, six meal choices, and four dessert choices. The princess-themed castle offers photos with various Disney princesses for guests. The wait for photos is usually about a half an hour. Hot and Cold Water: There are drinking fountains throughout the park and many restaurants provide hot water dispensers. Cash or Cards: The majority of the park is cash-based, but credit cards can be used in park restaurants. Some of the food price seems reasonable. Will know, when one goes there and experience it. Those rasberry tarts look pretty delicious, as does the turkey leg. It all seems a bit pricey though, are they quality or just over priced? I assure you Disney provides quality products..I can also assure you that the chinese with lil wang will try to sabotage Disney's reputation in china. Yeah, I am waiting for Wanda to start their smear campaign. They are opening rival parks and from what China has taught me, it's that they would rather ruin rivals reputations then build their own rep.